So much has been happening lately that I have been taking photos to keep track. 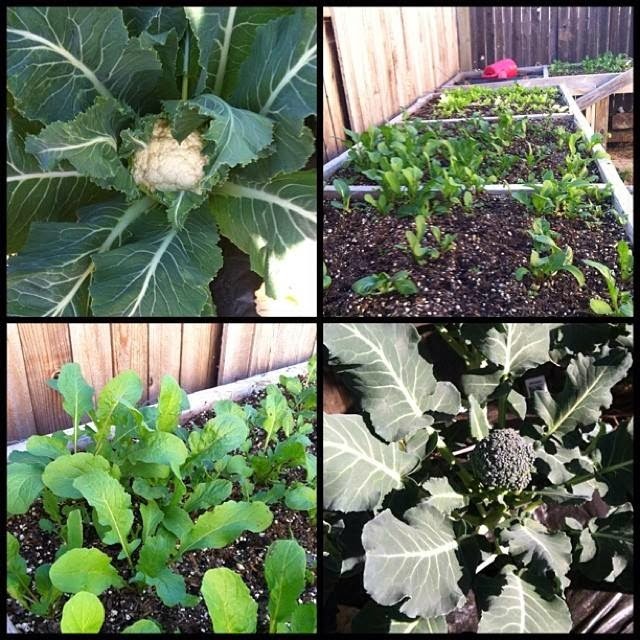 Since we have had such unseasonably warm weather for January, our garden has been growing like crazy. We expect rain tomorrow so that is wonderful news! Yeah, I know, right? 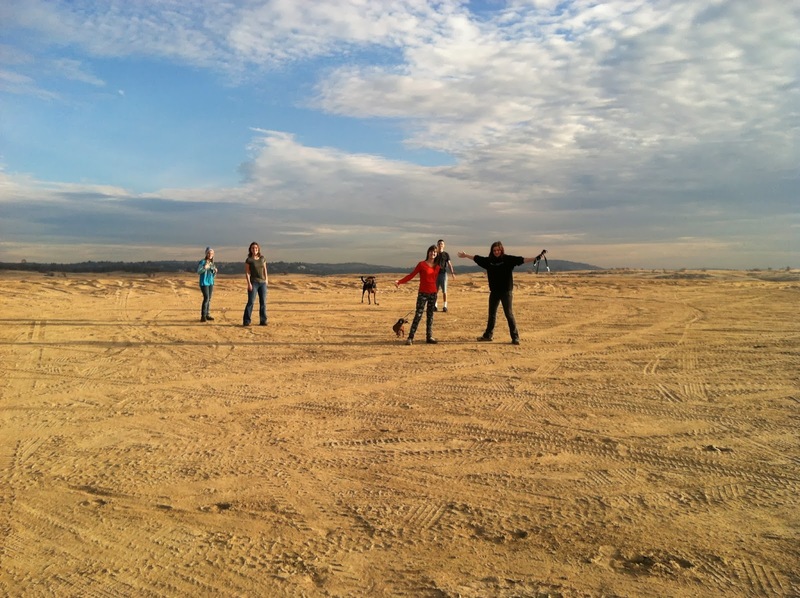 Where the kids are standing was the middle of Folsom Lake last year. Crazy. So does your family do game nights? We did the other night and while two of our number did not join in the fun, we had plenty of it anyway. 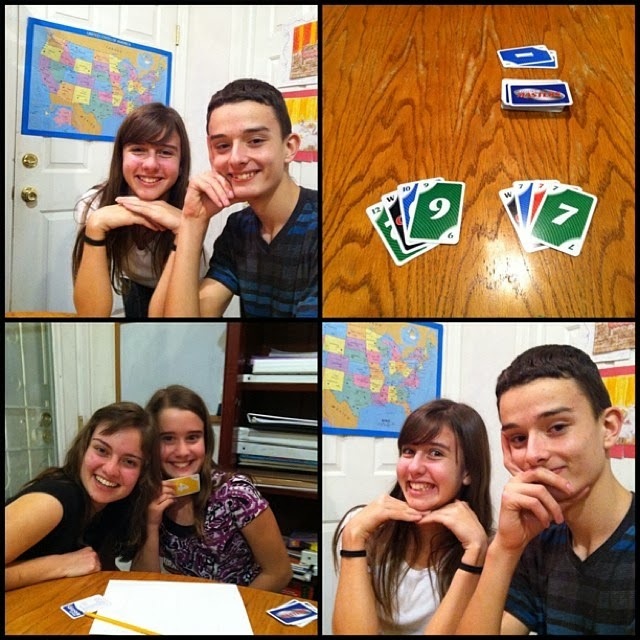 We played Phase 10 and played for hours and hours. We began with a single game of Rummikub and then jumped ship to Phase 10. What games do you like to play as a family? 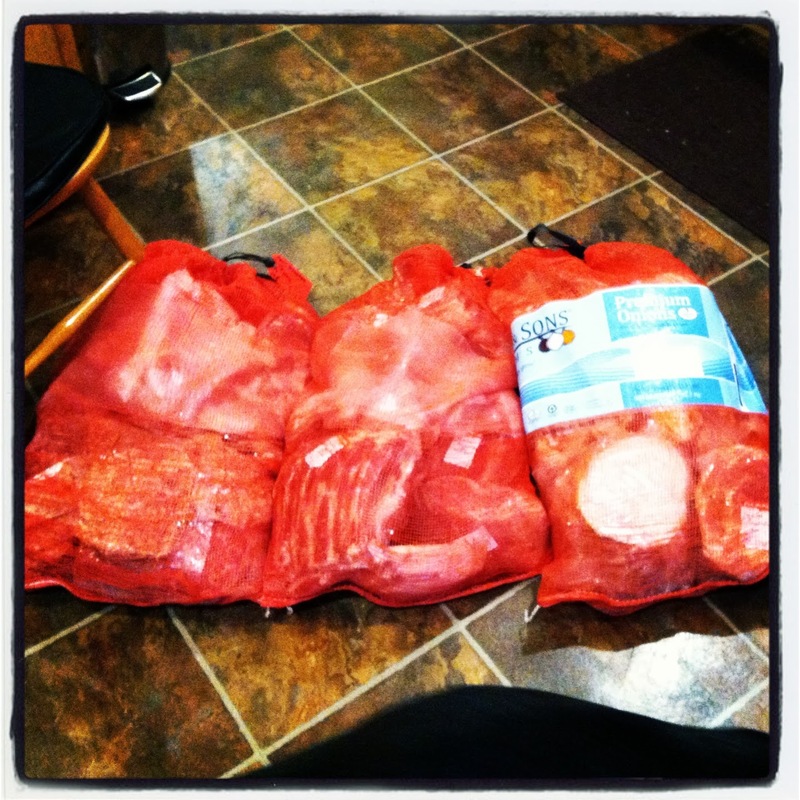 One of the most exciting things to arrive here recently was 99 pounds of pork! It came in all shapes and sizes and all types (and yes, there is bacon!) We have been experimenting with this deliciousness and I can definitely say that home-grown is MUCH better than anything you get in the store! Have you ever bought a side of something? We are! I never get enough history - that is absolutely how I feel about it. I love reading about it, watching videos, studying the time period, and immersing myself in historical fiction of any time period. Right now we are in Greece. We did a few fun things this past week, and one of them was downright delicious. While I had the older kids doing their map work with Knowledge Quest Map Trek, all the kids wanted to make their own edible maps of Greece. I started with a simple vanilla sugar cookie recipe, shaped the map to look roughly like the one seen here (found with a Google search), labelled that with a few cities I wanted the younger kids to know about, and let them go for it. 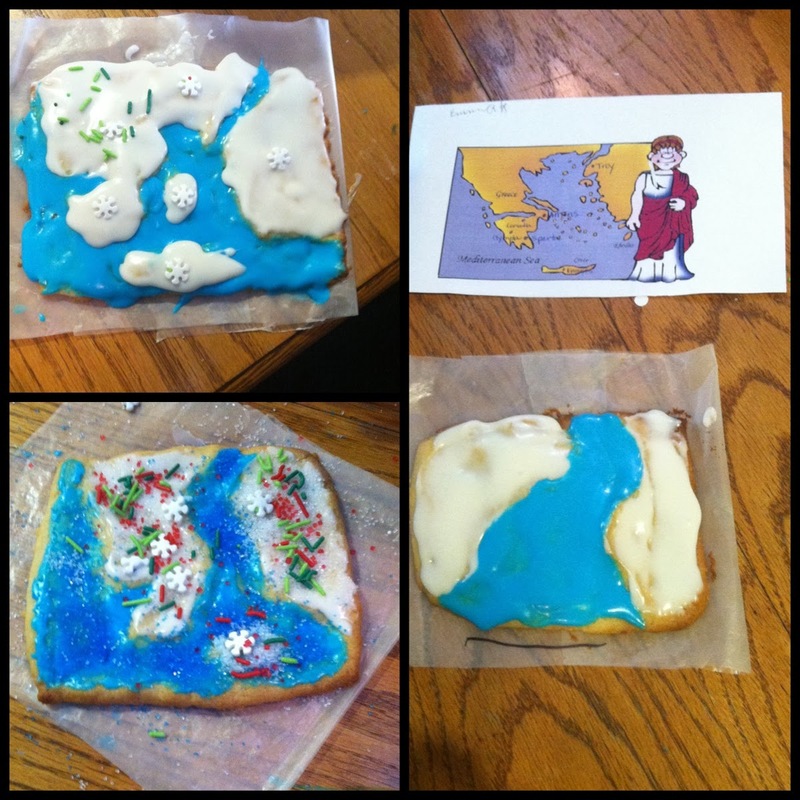 I especially like the one on the upper left corner as she really did work to make it look like Greece, and "labelled" it correctly with snowflakes. (Edible history, of course!) After the hard work, they ate them. We are using Biblioplan: Ancients and I have been enjoying it very much. The blend of Bible and Ancients is well woven. This week we began the study of ancient Greece, and of course we had to talk about the siege of Troy. I know there is some controversy over what is true of Homer's epic and what is fantasy. I wanted to know what might be out there to flesh out the story. 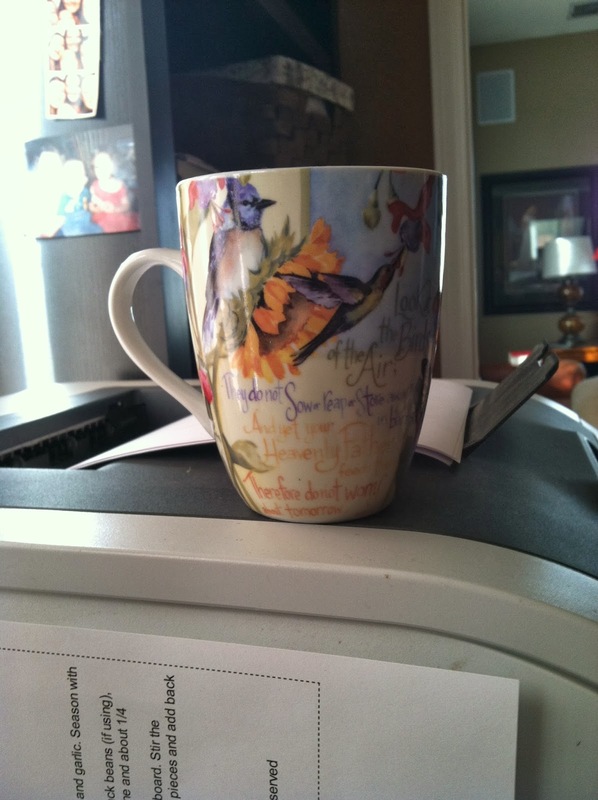 So where does a homeschool mom go for visual help with a subject? Yep, Youtube. So what did I find on Youtube? The Truth of Troy. It was *so* fascinating. Now you can find out what may or may not be true. Is it legend, myth, or is there truth to the story? This video combined science, archaeology, history, and storytelling all into one. I couldn't believe that it tied into the Chemistry lesson I had just taught the kids that very day, but it did! Talk about providential! Sometimes the kindness of God, and the little things He allows us to experience, just blows me away. So what are you studying in your homeschool history class? Have you found any good resources online? I wanted to post this because I love it. 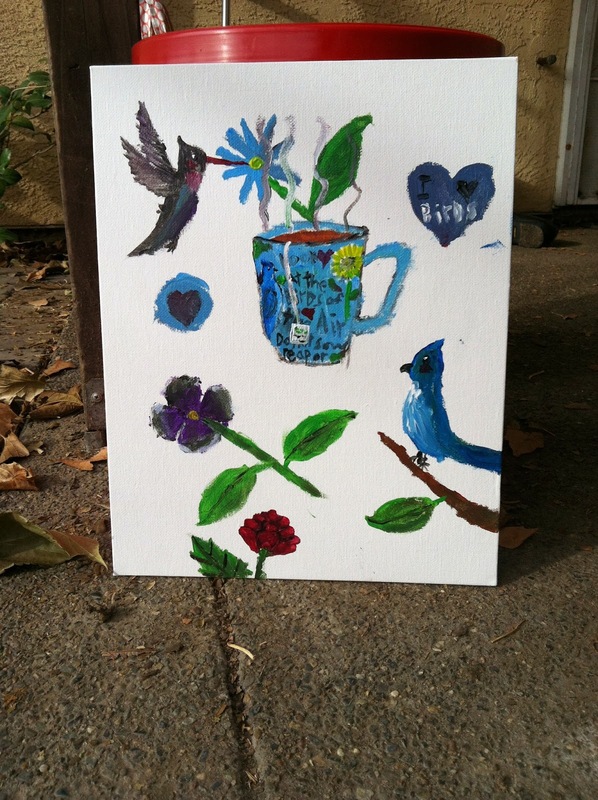 This is artwork done by my daughter today. She loves birds, as you can probably tell with the artwork above, but it brings me a lot of joy to see her creating things like her painting, just because she wants to. This was not an assignment, and she finished a bunch of school work before picking up her paints. Homeschooling means a lot of things at different times. Today it meant that we got to share part of what is in that creative mind of hers. I am very grateful. So for the first time in ten years of working, I took a full week off and did not check my work email at all. It was *amazing* to have that time to de-stress and just relax with my family! 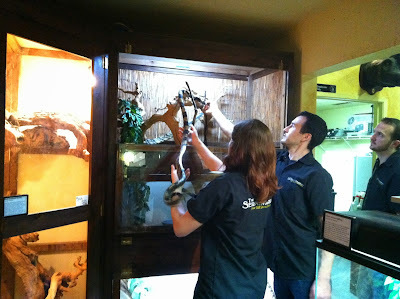 On Friday of last week, we went to The Snake Museum in Lodi, California. We know it as The Serpentarium. I had no idea what kind of neat things were there. We really enjoyed it and were pretty amazed at the variety of creatures they had - not just snakes! 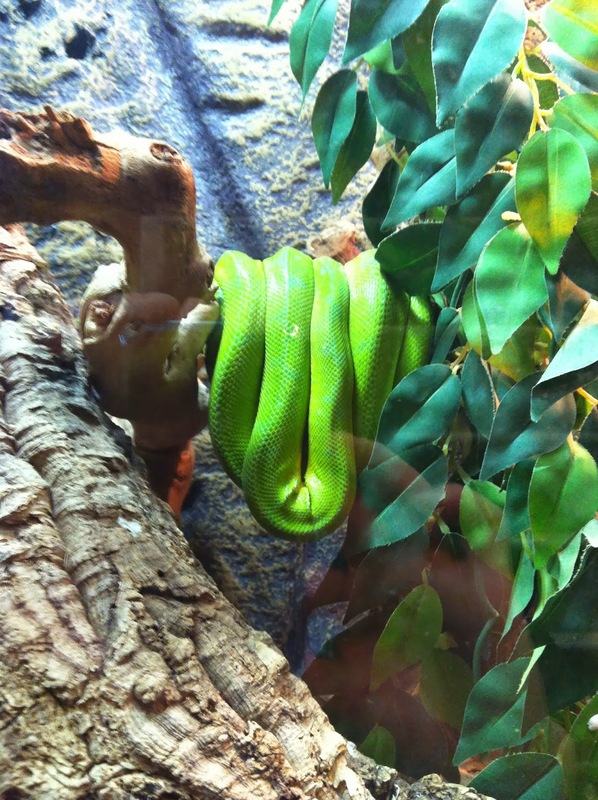 This was an anaconda that was army green with yellow spots. 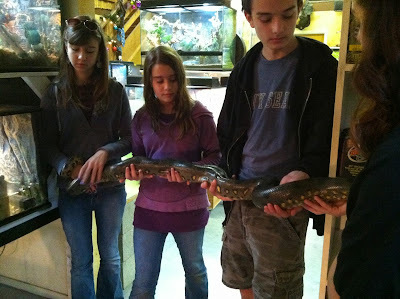 You could feel its muscles as it moved over the hands of the kids. Crazy! These are baby bearded dragons and they are so funny! 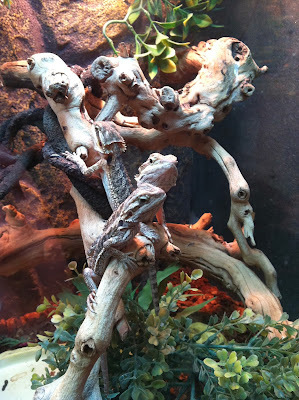 They have animated personalities and are very interested in those looking at them. They make a great pet if you want a reptile that will engage with you. 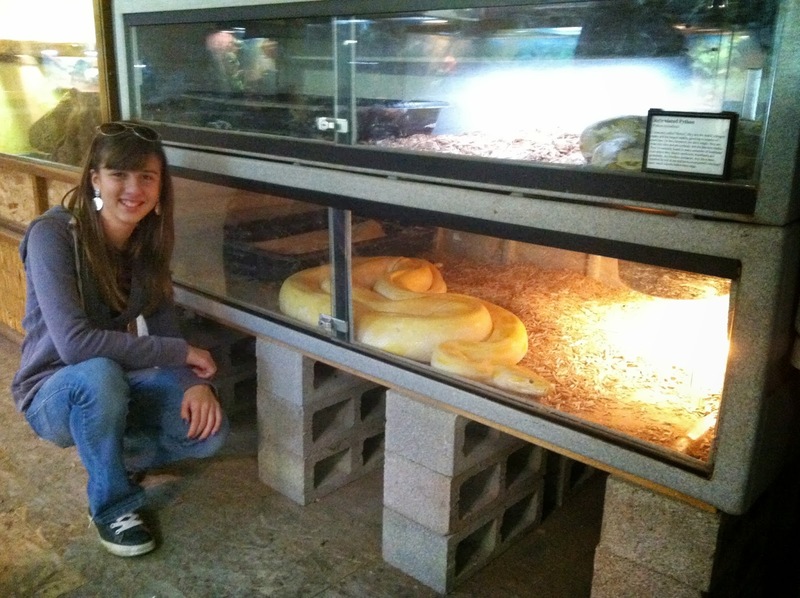 There is NO way to show you the size of this Burmese Python. Its body was as large as a dinner plate. You could NOT have gotten me to pet it for any money. 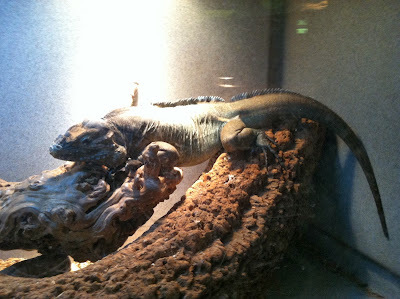 It was fascinating, but yikes - huge!! 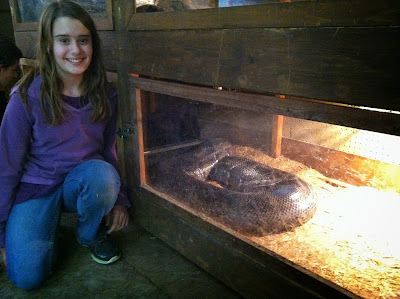 This was another large snake, but not anywhere near as huge. 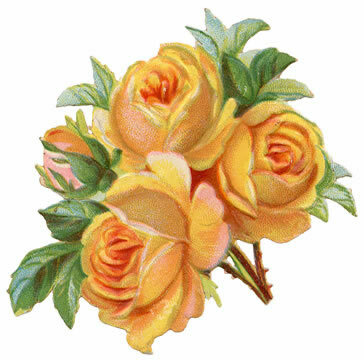 It was a beautiful yellow and white. I cannot remember the name of the snake. 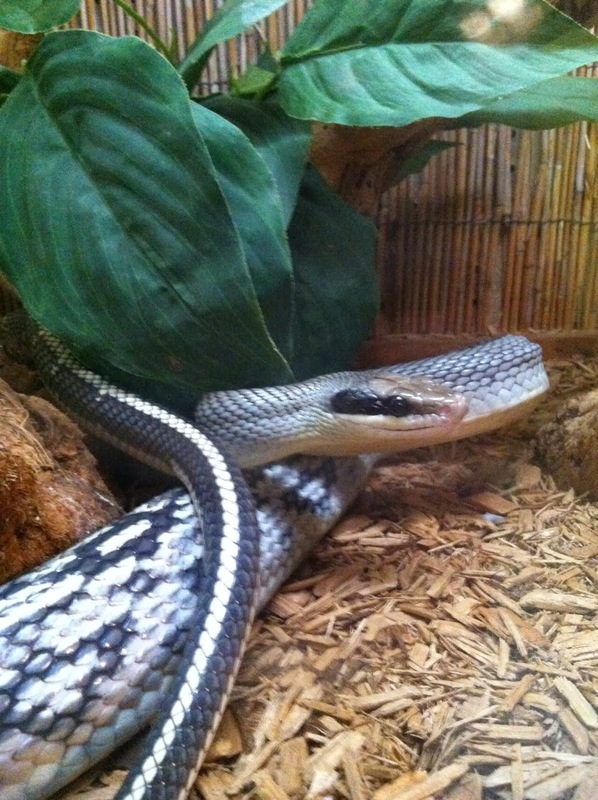 This was a rat snake of some kind and I thought he had particularly beautiful coloring. 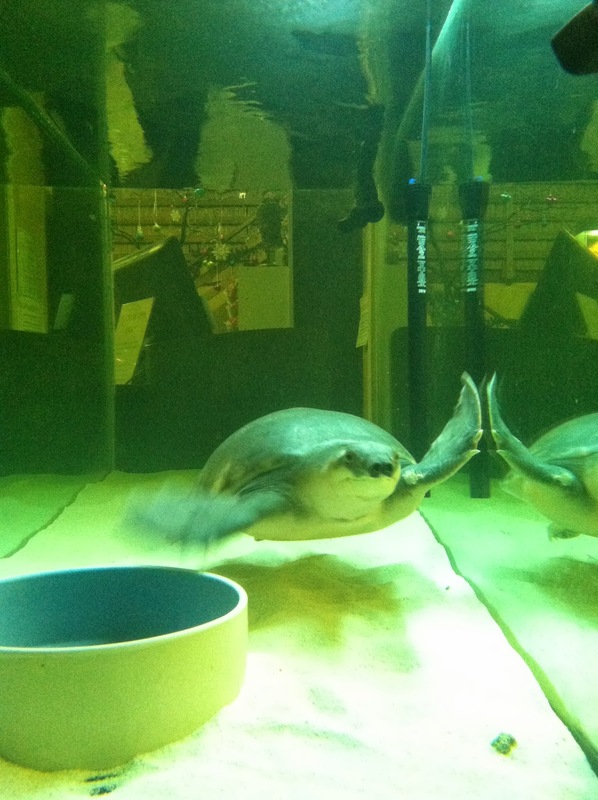 They had two very interesting fresh water turtles. I loved watching the graceful way they swam in the water. I had never seen this kind of turtle before and they had two! The owner was training an employee here to handle the Tiger Rat Snakes. They were fast moving and it was fascinating to watch. I stood back about 15 feet. 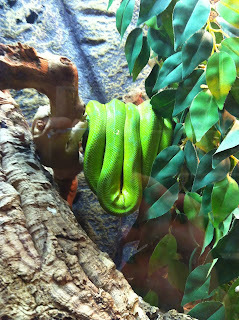 This last photo is of a Green Tree Python. They are my favorite snake. I think they are beautiful and so interesting! They are about $500 or more and are well out of our league, but I still like seeing them and admire them every time I see them. So would you have enjoyed this place or would you have run for cover? If you are ever near Lodi, definitely make the time to come.